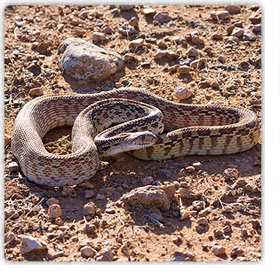 While not all of the snakes that can be found in and around the Phoenix city limits, these are some of the most common. Even if you believe the snake to be non-venomous, never attempt to handle a wild snake unless you are absolutely sure of the identification. 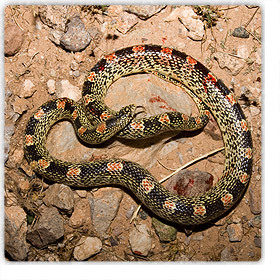 For more information about wild reptiles in Arizona and neighboring states, take a look at this site devoted to field herpetology. 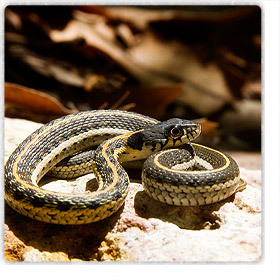 If you need help identifying a snake, please email info@phoenixsnakeremoval.com. There is no fee to ID a snake. 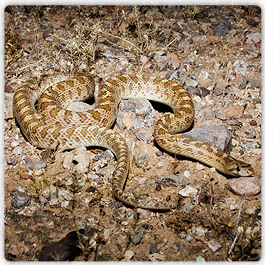 Venomous This is the most commonly encountered rattlesnake in the valley, and can be found anywhere where neighborhoods get close to native desert habitat. 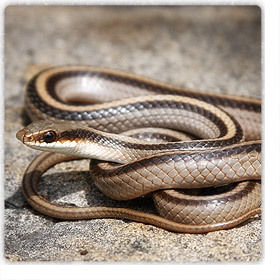 They are large, aggressive, and venomous, so keep your distance and let it move on, or call for safe removal. 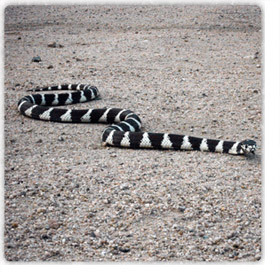 They can be identified by the rattle, white and black striped tail, and white-lined diamond pattern on the back. Coloration is usually drab shades of brown or grey. 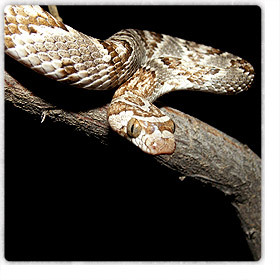 VenomousSidewinders are small rattlesnakes that live in sandy desert areas. 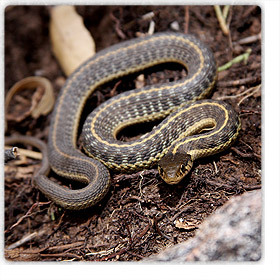 Most are 2 feet long or less, and move with a distinctive side-winding motion. 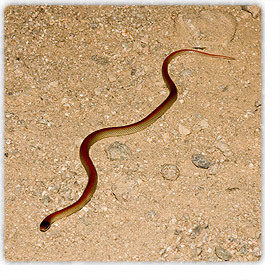 These are common in the outskirts of the West Valley in washes or flat, open areas. They avoid rocky areas. They are easily identified by the horns that protrude over each eye, and the white and brown ribbon going down the back. 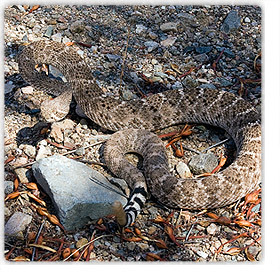 Venomous Speckled rattlesnakes live in rocky areas near mountains or hillsides. 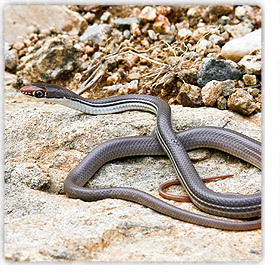 They’re common in the South Mountain area and other parts of the valley adjacent to similar habitat. They are highly variable in color, from a white/grey in the South Mountain and White Tanks areas, brown in North Phoenix, and orange and red going North into Cave Creek and the Anthem areas. They have a loosely banded pattern that is highly flecked to resemble granite. 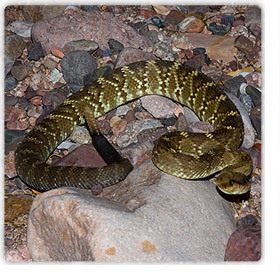 The Blacktailed Rattlesnake near Phoenix is mostly brown, tinted with yellow, orange, or green. 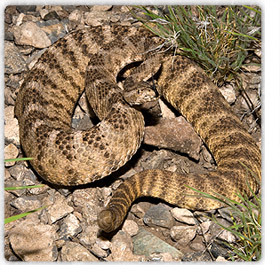 They have a vivid pattern unlike other large rattlesnakes, and an all-black tail, as the name implies. 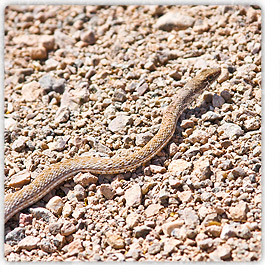 Venomous The Mojave Rattlesnake lives in open desert areas, and is highly dangerous. Unlike the other rattlesnakes in Arizona, the Mojave Rattlesnake carries a powerful neurotoxin. 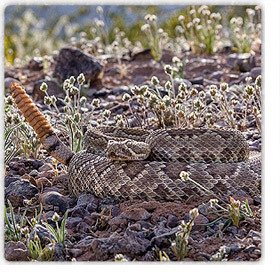 The Mojave Rattlesnake is often confused with the Western Diamondback Rattlesnake, and can be differentiated by more white-dominated tail banding, as well as a generally more “clean” appearance than the Diamondback. 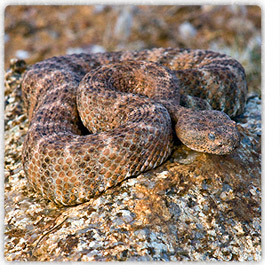 Venomous The Tiger Rattlesnake lives in many of the same rocky, mountainous areas as the Speckled Rattlesnake. They are seldom seen, but live in all of the Valley’s mountain areas. 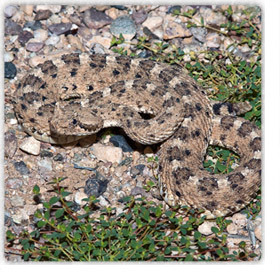 The Tiger Rattlesnake is often confused with the Speckled Rattlesnake, but can be easily identified by the unusually small head and large rattle. The banding is more apparent throughout the body, which is usually grey with varying degrees of pink, orange, or brown. 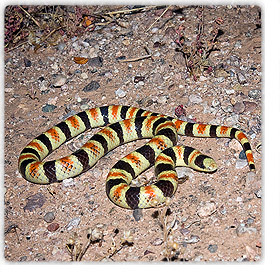 VenomousThe Sonoran Coralsnake is a small secretive snake that is very rarely seen. Though it lives in entirety of the desert surrounding the Phoenix area, it mostly stays underground. They are small, maxing out at under 2', with most being much smaller than that. 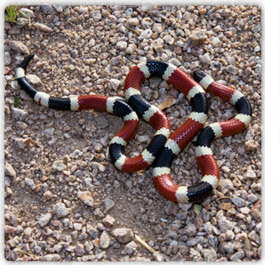 The "red touch yellow" rhyme people use to tell the difference between coralsnakes and non-venomous impostors doesn't work in Arizona, where the coralsnake's bands can be more white than yellow. The coralsnake's head is very small and it would be difficult to actually take a bite without first picking the animal up or stepping directly on it while barefoot. 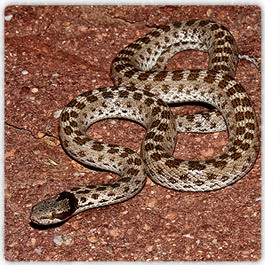 Harmless The Sonoran Gophersnake is a large snake that can be found everywhere in the Phoenix area, even in alleyways and backyards in urban areas. These are very commonly mistaken for rattlesnakes due to a very good impersonation, which includes flattening the head, loud hissing, striking, and even a rattling tail. While they can become quite large and give a painful bite, they are otherwise completely harmless and great to have around. 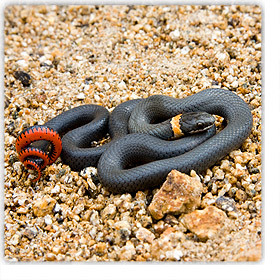 Harmless The nightsnake found in our area is very small, usually under 1.5'. They are common to see on desert trails at night and in garages, sheds, and under yard debris, as well as in well landscaped apartment complex areas throughout the city. 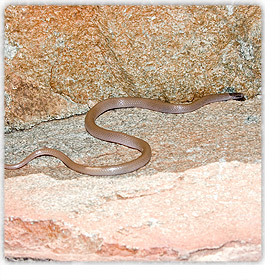 This snake, as the name implies, is completely nocturnal, and won't be seen on the move during the daytime. It does have a mild venom, but it is not dangerous to people, and you'd have a difficult time finding one that will try and bite. Harmless The kingsnake is very easy to identify by the high-contrast white and black bands that run the entire length of the body. They are common anywhere near open desert areas. Kingsnakes are great to have around your home because one of their primary food sources are other snakes, including rattlesnakes. Even if you're scared of snakes, if you see one of these on the crawl in your yard, consider yourself lucky for the natural rattler protection. Copyright © Rattlesnake Solutions LLC. All rights reserved.